The Firm - Casillas Santiago Torres Law LLC. The firm was created with a vision to provide the highest quality work, technical expertise and knowhow equivalent to that found in large firms through a more efficient business structure. Our policies are designed to allow us to provide a higher emphasis on service and undivided attention to our clients. The firm has a strong commitment to bringing cost-effective solutions to clients who depend on us from the routine to the most complex, novel and sophisticated matters. Our firm strives to build relationships with our clients that transcend the mere provision of legal services to become their business partners. Our firm’s attorneys are known for having substantial and diverse experience in their fields. This experience gives our law firm the breath, scope and insight that are expected from a full service institutional firm. All of our attorneys have ample major law firm experience or have either served with government agencies, the judicial branch or private corporations or a combination of the above. Thus, having the legal skills and business sense required to handle complex disputes, controversies and resolve difficult regulatory and business problems. Casillas, Santiago & Torres, LLC is a sophisticated boutique firm focused on business and commercial law practice in Puerto Rico. We offer our clients legal services and advise with a win-win philosophy to provide the best possible value and results. Casillas, Santiago & Torres, LLC (CST), was founded by three prominent attorneys who are leaders in their respective areas of practice. CST is the product of a joint venture between Juan J. Casillas, Miguel A. Santiago and Luis L. Torres Marrero. 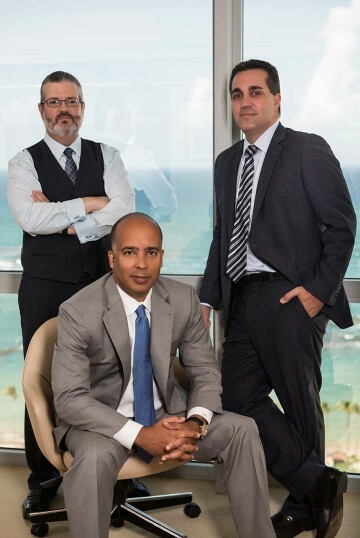 Before founding the firm, these three entrepreneurs held coveted positions as partners in one of Puerto Rico’s largest and most seasoned law firms. The founding members of Casillas, Santiago & Torres, LLC, keep their longstanding practice and commitment to maintaining a vibrant but conservative legal practice, unparalleled work ethics, excellent service and profound technical expertise. As entrepreneurs, the founding members of CST also had the vision to identify our clients’ need for an alternative solution to the high cost structure of large law firms and their inability to effectively evolve in this changing economic landscape. CST’s philosophy is to provide legal advice on a personal basis and tailored to our customer needs. CST also embraces modern trends through its understanding that the productivity and quality of the work of its attorneys is enhanced by providing a pleasant, flexible, diverse, inclusive and comfortable work environment. Ever since its beginning, CST has been steadily growing its client base because of the dedication, hard work and effort of its members, and by adding likeminded service oriented attorneys that have superior legal skills and experience. Currently, CST has expanded its legal areas to offer a full range of legal services to our clients. All of the firm’s attorneys are committed to vigilantly watch the interests of our clients. As such, all of our attorneys actively participate in business activities and gatherings relevant to their client’s line of business. The firm’s attorneys also partake in civic and industry trade associations, legal panels, conferencing in seminars, and they are often asked to comment or draft pending legislation and/or rules and regulations in the Commonwealth of Puerto Rico. Casillas, Santiago & Torres, LLC is a sophisticated boutique law firm that offers legal services in the areas of labor and employment, litigation, business immigration, employee benefits, government and legislative affairs, and corporate and tax law. Copyright 2015 Casillas, Santiago & Torres Law LLC. All Rights Reserved.